all the damages and underlying conditions that cause you pain. 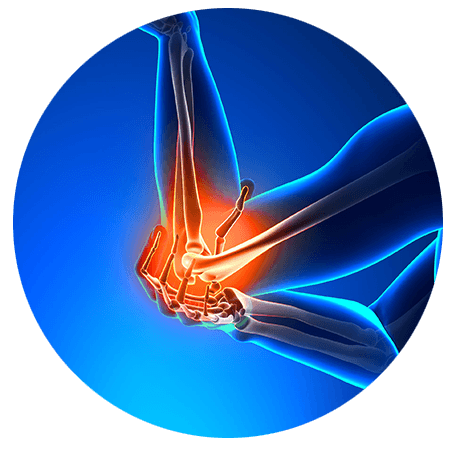 Front Range Regenerative Medicine’s partner healthcare providers have extensive experience when it comes to treating conditions of the elbow. We have pioneered the industry’s latest proven alternatives to surgery and steroids. Our in-office, same-day procedures will alleviate your elbow pain regardless of the cause. We treat a range of elbow conditions resulting from distal biceps tendon partial tear, osteoarthritis of the elbow, ulnar collateral ligament injury, etc. Our revolutionary regenerative medical procedures treat all the damages and underlying conditions that cause you pain. Our doctors use regenerative cellular therapy to help rebuild and strengthen the damaged tissue. At Front Range Regenerative Medicine our partner healthcare providers use regenerative procedures the can treat the following elbow conditions. This list does not contain all the conditions we treat, so please contact us to find out if we can treat your condition.